Last week's post on the rotting cheeseburger has created controversy here on Snack-Girl. If you didn't see it check it out here McDonald's Burger Left for Two Weeks. The question remains, why didn't the McD's cheeseburger show signs of rot? I contacted McDonald's multiple times (including their VP of Corporate Relations), and Michael Pollan. I received an unsatisfying message from McD's, posted below. Michael Pollan was probably too busy to answer. Many Snack-Girl commenters have given opinions on why the McDonald's cheeseburger didn't rot and the homemade burger did. Intuitively, we know that the McD's cheeseburger should show signs of decomposition after 11 days in a plastic bag at room temperature. BUT, we also know with billions and billions served that a McD's cheeseburger isn't poisonous. We will live after eating a bunch of them - and some who commented eat a few a week and tell us that they are just fine. So, what happened? The hypotheses posted on the site ranged from my kitchen being dirty (hey, I'm not going to argue about that - I'm not Martha Stewart) to ammonia in beef. I was lucky enough to get a scientist to talk with me about the experiment. Justin L. Sonnenburg, Ph. D., is an Assistant Professor in the Department of Microbiology and Immunology at the Stanford University School of Medicine. He studies gut microbes. Did you know that there are 10-100 trillion microbes that reside in our gastrointestinal tract representing thousands of species? What does that mean? You are a walking bag of bacteria, fungi and other organisms. You have more microbial cells in your gut than cells in your body. Crazy, no? Those bacteria aid digestion of food along with stomach acids. I think it is possible that multiple factors contributed to the longevity of the commercial burger (e.g., nearly sterile starting material, preservatives, poor in nutrients required for growth of many microbes). Regardless, it is clear that many foods we eat, (whether they are processed, refrigerated, pasteurized, etc) have a much lower microbial burden than the foods with which our ancestors coevolved. In the case of preservatives and low nutrient content we consume 'food' that is not optimal for our health. In other words, the McD's burger didn't have many microbes in it. A conclusion that McDonald's (see below) would agree with. It is counterintuitive to think that bacteria in food is a good thing. But it is! Obviously if we live with 100 Trillion bacteria and fungi, etc. in our gut, they are important to our health. We know that some bacteria, such as certain strains of E. Coli, in our food can kill us. But, these instances are pretty rare and are (usually) the result of terrible food manufacturer practices. E. Coli is a bad guy but there are many good guys. And when we distill the "life" out of our food we lose a major component in food that makes us healthy. Eating fermented foods (eg yogurt) is one potential way to supplement back some of these microbes that historically were consumed by our ancestors on rotten food; and indeed there are many health benefits ascribed to such probiotics. Unfortunately, the probiotic field has been plagued by poor science and research pursued by entities with a conflict of interest - but that is currently changing, so stay tuned. So, eat some FAGE or other yogurt. Your tummy will thank you! Thank you for contacting McDonald's. I appreciate this opportunity to share some information with you about our menu items. We care about what you and your family eat. That's why we take great pride in the quality of our food. Since our first restaurant was built, we have purchased quality ingredients from trusted, industry-leading brands. We also carefully monitor our products, distribution and storage procedures; and use state-of-the-art computerized preparation methods in our restaurants. Not only do we meet government standards, but in many cases, we exceed them with our own strict quality control. Every day, in every one of our restaurants around the world, our family promises to serve a quality meal every time to your family...we call it our quality promise. We don't think of quality as an extra ingredient that gets added on whenever it's called for. It's the main ingredient - an irreplaceable element in every recipe. Thanks for the follow-up report - much appreciated. Now that Spring is here, we can start growing our gardens and start eating fresh fruit and veggies that are delicious. And, will of course rot after a few days. What a lame answer from McDonald's. It basically says we do not want to answer your question, but we can tell you about something else. Corporate speak directly to consumers does not work very well. Lisa, I continue to adore you even though you left me in sf all by myself!! Am I the only one that bawked and laughed each time the McDonald's response parrot used the word "restaurant"...???? Any chance you can show us what the insides look like? I'm curious if it's just the bread that looks that bad. I started following you on twitter, now facebook, you're amazing for making us think! This is basically what you (and we) have known all along. McD's is just full of fake stuff. Supersize me started the trend, king of corn, food inc and the future of food have solidified to not eat these foods. I'd say, if you can't buy the ingredient, or if you can't recognize an ingredient - don't buy it/consume it. Actually many of the bacteria that we live with obviously aid us. But that doesn't apply to the fungi. 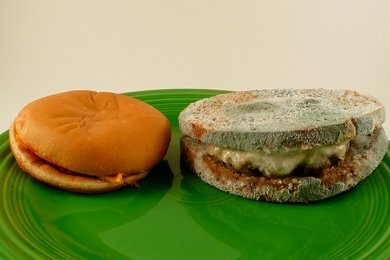 Most of the mold present on foods (e.g. on top of homemade jams, preserved fruits, spoiled yoghurts etc.) are actually bad for you. They probably won't kill you instantly (due to the low dosage of the toxins you'd ingest), but still they are loaded with carcinogenic and liver-destroying toxins. As the Stanford guy has pointed out, food from McDonald's is probably sterile or almost sterile which means that even without preservatives it will hold out much longer than the average homemade burger. This is especially true considering the fact that even the hamburgers' preparation is quite sterile (they wear gloves, pack the thing into wrapping, heated before serving etc.). This all contributes to the fact that they remain "fresh" in a ziploc bag. As contrary to what many people think most of the bacteria and fungi is transferred to the food by the humans. Did you touch your mouth with your hand at any point between washing your hands and preparing your hamburger? Sure you did :P BTW your typical American bun contains quite a lot of sugar (compared to buns made in Europe for instance) to make it all light and puffy. Therefore it's an ideal nutrition source for all kinds of moulds, since they all gain their energy from fermenting sugar. Bacteria tend to like proteins more, which they break down using their enzymes. Therefore if the meat isn't contaminated from the inside by bacteria, it'll begin to rot from the outside and progress to the inside (just like fruits do). The same applies to the bun with the fungus. Ok, I can kind of understand the sterile environment, but you touched it when you got home to put it in your baggie, and unless you thoroughly washed your hands there should be some germs on it, shouldn't there?? I'm not convinced one's in a sterile environment and the other isn't. Thanks for the research! It's all very intriguing and reinforcing for me why we don't eat commercially processed foods. Thanks again! Regarding the sterile; I did some further research on this and it's not just a sterile environment, as you stated, it is that all the ingredients used in McDonald's is sterilized and "cleaned" removing bacteria. This gives them greater control over food "quality" and shelf life and allows for pretty constant food expectations across all locations. So perhaps the real question should be "what is the definition of food?" Kudos to you! I really enjoy reading your articles. Very eye opening. The only thing I have from McDonald's is their coffee. I enjoy yor recipes of course! I have upon my mantel my very first McD burger Ma and Pa bought me around 46 years ago. They have passed on to that great fast-food joint wherever it is. I keep my beloved burger for sentimental reasons. And it looks even better now than when first bought.